The hiatus which occurs between piano exams can be a problem. Ideally, this should be a time when the young pianist is full of enthusiasm and ideas about what he’d like to learn next. He should be thrilled and proud to have met – or even exceeded – expectations in his exam and looking forward to a change before moving up to the next grade. In some cases this does happen. However, in others, pianists who seem disciplined and self-motivated when working towards an exam become lazy and disinterested when given the freedom to play purely for pleasure. One solution is not to have any break at all from exams but to move straight to the next level. While this may not sound ideal, for some it’s the best way to keep up the momentum. In any case, I always move the scales up a grade immediately after an exam has been completed and even before the results are out. So far, I have encountered little resistance to this – most pupils are so relieved that the exam pressure is off them for a while that they seem quite receptive to the idea of learning a new scale. I tend to start with scales and arpeggios which overlap the grades and then gradually move on to the easiest of the new ones. Piano students who prefer to choose their own music should try visiting their local music shop where – if pianos and electronic keyboards are sold – they may be able to try out a few pieces to check the level of difficulty. Alternatively they can visit online sites Musicroom.com or – particularly if they want to read reviews – Amazon UK/Amazon US. I never dictate which piece a pupil should move on to after an exam, as I like him to have some say in the matter. However, I feel I should be able to offer some suggestions and advice. In some cases, there’s a very simple solution, which is to play one of the other pieces in the exam book he has already been working on. Quite often, when a pupil makes his exam selections he is torn between two pieces – particularly in the C section where there is invariably more to appeal to a younger pianist. There are two advantages to playing one of these pieces: firstly the pupil already has the music so there is no delay in starting work on it and secondly it saves parents the cost of forking out for a new book straight away. 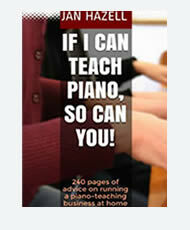 (I tend to suggest books rather than individual piano sheet music which can prove expensive … although if you hunt around you can find some free piano sheet music online). Thinking back to my own childhood lessons, ‘Mrs Bam Bam’ would make me learn the majority of pieces in an exam book, rather than ‘waste’ them. (I don’t know whether this was a deliberate attempt to save my parents money or whether she just lacked imagination). Some of my pupils decide to continue with the John W. Schaum series and move on to The Blue Book followed by The Purple Book. Although this sometimes seems an easy option, I have no objections to anyone choosing to do this. The illustrations make the books inviting to young people and new rhythms, key signatures, dynamics etc. are all introduced at a very gradual pace. While some learners are inspired by variety and change, others benefit from familiarity and continuity. Pupils may choose to play a specific piece which they have heard or which parents or grandparents have mentioned or played. Beethoven’s Fur Elise and Piano Sonata No. 14 in C Sharp Minor (better known as Moonlight Sonata) are two of the most common choices. Scott Joplin’s The Entertainer (from the movie The Sting) is another popular one – especially among the younger generation, who are often more engaged by upbeat tunes, which they enjoy playing to impress friends. There are plenty of other popular film tunes worth learning including the themes to Pirates of the Caribbean, Chariots of Fire, Schindler’s List, Star Wars and Twilight. For movie fans it may be worth investing in a piano movie theme book. Younger children may also enjoy playing Disney piano music. A decision has to be made about whether the learner is really ready for a particular well-known classic. Of course, it’s easy to obtain simplified versions of virtually any piece but, on the whole, I prefer to wait until a pupil is advanced enough to learn the real thing. I have heard Fur Elise played many times with just the right hand, or without ‘the fast bit’ but – as it is easily manageable by a grade 4 or 5 pianist – I prefer to wait long enough to teach the complete original version. The exception to this is with my adult learners who can make their own mature and informed decisions about how much of a challenge they’re prepared to take on. Some would obtain little pleasure or satisfaction from spending weeks or months working on an original version of a classic, knowing they could have learned a handful of simplified pieces in the same time. There are plenty of collections of well-know music – some offering shortened or simplified versions (such as All The Tunes You’ve Ever Wanted to Play:All Time Piano Classics). There’s no point in being snobby about it – pupils are paying customers: it’s far better for adult learners to play music in a way which they enjoy rather than to struggle with a difficult key signature or a series of complex chords just because that’s the way one of the great composers intended it to be. For those who do want to play the ‘real’ tunes Classics to Moderns is a well-planned series of books which are graded for difficulty yet contain original works by well-known composers – from Baroque pieces right through to 20th century works. For those who are grade 5 standard or above, I would recommend Quiet Classics: this includes both Fur Elise and Moonlight Sonata, amongst many other beautiful pieces. One practical advantage of this book is the spiral binding – so many piano books are frustratingly difficult to keep open – especially if your stand doesn’t have folding metal bars to hold the back pages. For pianists who want a break from traditional classical music, I generally recommend jazz in preference to pop. There are plenty of challenging, yet fun, jazz pieces and these can also be good preparation for the C pieces in the ABRSM exams. Learners need to grasp the idea of a swing rhythm, for example. One book I often recommend is: What Jazz ‘n’ Blues Can I Play? Grades 1, 2 and 3. This includes several very well-known pieces (starting with When The Saints Go Marching In) and the pieces increase in difficulty throughout the book. One of my biggest dreads is when a pupil decides he wants to start learning current chart hits. Of course, I totally understand the desire to do this – what youngster wouldn’t want to show off to his friends that he can play their favourite songs? However, the problem with books of pop music is that they are so often labelled ‘easy arrangements’ yet pupils often find them quite difficult to play – and many want to give up before the piece has been completed. The synchronised rhythms can be challenging and – what’s worse – the written music, even when played correctly, never seems to sound quite like the original hit. So many of these tunes are designed to be played on guitars and have been ‘arranged for piano’ with a repetitive or boring baseline. There are some notable exceptions: artists such as Elton John and Lady Gaga are talented pianists themselves, so they write songs which work well as piano solos. Of course, anyone with a decent singing voice should be encouraged to learn the words as well so he can work towards a more complete performance. If I feel a pupil is desperate to play a piece of unmelodic-sounding pop music (and likely to give up altogether if I don’t agree to it!) I would suggest learning a simple classical piece at the same time. At least that way I feel I’m teaching him one piece which will still be worth listening to in decades to come. The period between exams can be an ideal opportunity for pupils to prepare for public performances. This may sound like swapping one type of pressure for another (which it is!) but some pupils thrive on a challenge. There are teachers who put their pupils forward for music festivals. I have no experience of this: to be honest this is partly due to my own laziness but I also doubt that the majority of my pupils (or their parents) would have a strong enough desire to do what’s required for this type of competition. However, I believe most schools offer some opportunity for performing in front of an audience – whether this is within a classroom situation, a school assembly or an end of year concert – and pupils should be encouraged to mention to their teachers that they take piano lessons out of school. My two sons performed in a few assemblies in their primary school and have also been involved in a number of concerts in secondary school. Although they have both given solo performances, I think they prefer playing duets. There may be a few fall-outs during rehearsals but, on the day, it can be reassuring to have someone sitting alongside you, knowing that they will carry on and keep the music going if you stumble. The best-received (and perhaps most enjoyable to perform) duet my sons have ever played was Sleigh Ride by Leroy Anderson. This is a great piece to put everyone in the festive mood and works particularly well as a duet. They have also played a piece from the excellent Christmas duet book by Robert D Vandall entitled Christmas Duet Fantasies which contains elaborate arrangements of four festive classics. This can be purchased at Amazon UK/Amazon US. Some people confuse playing for pleasure with ‘fun’ and I certainly wouldn’t describe piano practice as ‘fun’ (although performing certainly can be). On the whole practice means hard work, with a lot of ‘boring’ repetition, coupled with feelings of frustration (and – in some cases – distress and anger). While this is not really fun, it’s extremely satisfying: to have worked for hours on perfecting a tricky rhythm and finally ‘getting it right’ is one of the things which makes piano-playing so enjoyable. One of the peaks of this enjoyment occurs when the grade 8 exam has been successfully completed. I have experienced reaching this point as a pupil and know that it’s incredibly satisfying and exciting. 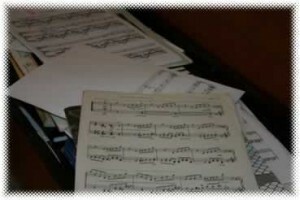 Once you know how to read sheet music with confidence, you can pick up virtually any new piece and have a go at it. Some music will be very easy to play but there are still so many wonderful pieces to challenge you … and every one you learn can be a piece of your choice so it should always be a pleasure (rather than the ‘chore’ which you might feel with some exam pieces). In my case, the greatest pleasure is in playing something by Chopin: my favourite of all time is probably the beautiful second movement (‘Romance’) from his Piano Concerto No. 1 in E minor. 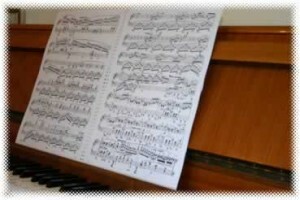 (This movement is also in the compilation book The Easy Piano Collection: Chopin Gold). Sometimes I attempt one of Chopin’s ballades (Ballade No.1 in G Minor is a particularly challenging yet rewarding one) … or, if I’m feeling brave enough, a Rachmaninov piano concerto. However, although I generally prefer playing classical music, I enjoy the odd bit of rock as well. If I’m in a self-indulgent mood, I can really get into Bohemian Rhapsody from Queen – Deluxe Anthology (which I play very loudly) – or, when I’m feeling nostalgic, I love Undertow from the Genesis album And Then There Were Three – which is difficult to buy now, although if you’re interested you may find an old copy at eBay.co.uk or eBay.com.